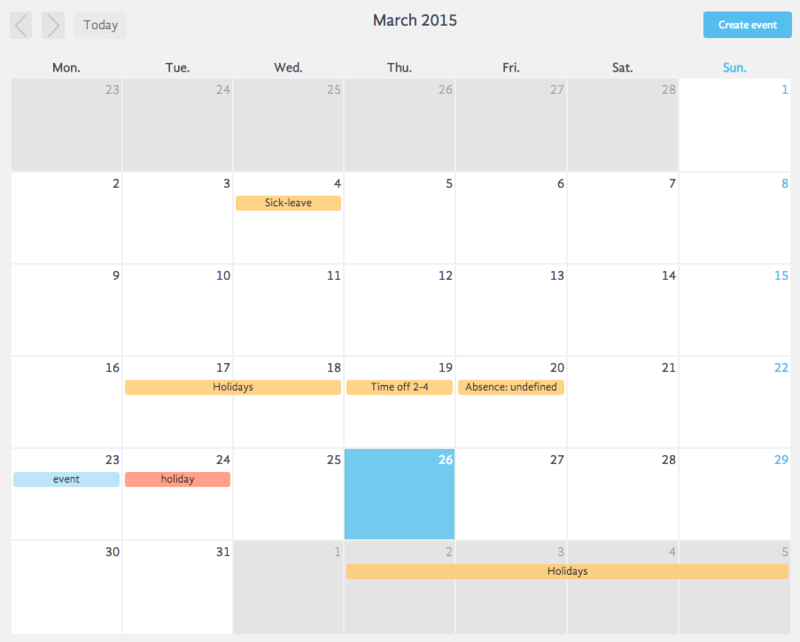 In this section it is possible to manage calendar and all important dates and events whether we are talking about personal or professional ones. As we can see in the first picture, each event type is colored differently to allow you a better visualization. An event can be created in two ways. First one, by clicking on the button "Create event" and inserting required information. Second one, by clicking on a specific day or by sliding and selecting few days of our interest afterwhich a pop up window will open where it is neccessary to insert all required information. In the example on the second picture we can see the process of event generation. 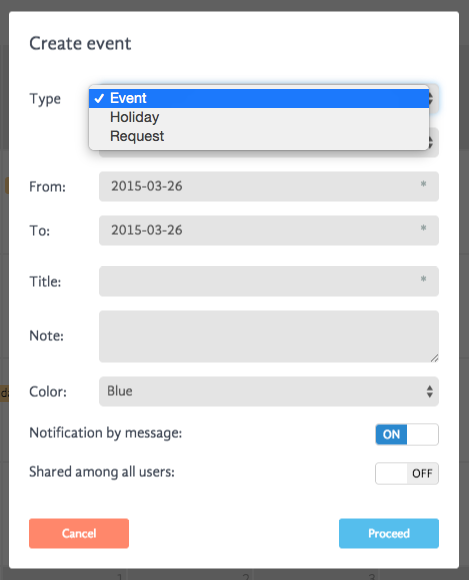 First thing that an user needs to do is to choose a type of the event (event, holiday or request). Once defined a type of the event, it is required to define a period of time and event title. Moreover, there is a possibility to define a precise time in which an event is going to be held as well as its duration. It is also possible to invite other BadgeBox users to take part at this events. This come quite handy when one wants to organize company's meetings. Each user that is being invited to a specific event is being informed to attend the event by receiving a notification. In order to manage better all events, it is possible to write a note related to the event and choose a color of its visualization. Moreover, it is possible to choose whether or not you want to receive notifications related to the event created and whether or not you want to share the event with all users.